The Large Hadron Collider (LHC) at CERN is well known for the massive amounts of physical data it produces. In this project, we collaborate with physicists from the LHCb collaboration and address the data processing needs that arise there. The main objective of the C5 project is to develop new methods to realise the data processing tasks within LHCb. We also strive to adapt existing methods to understand whether/how they would apply in the context of LHCb. A very important aspect of the project is to evaluate methods in an environment like the one at CERN; specifically, we are only interested in solutions that will carry to a very large scale (such as thousands of compute nodes). The other angle of the project is to connect the application domain with methodology established within the CRC; examples are the use of compact data summaries (e.g., to avoid scanning huge amounts of data), streaming algorithms (e.g., the “trigger stage” at LHCb has to ingest a high-volume data stream and react with real-time characteristics), or the consideration of low-power platforms. The project entered the CRC at phase 2. During that phase, we developed solutions to individual, isolated problems within LHCb. 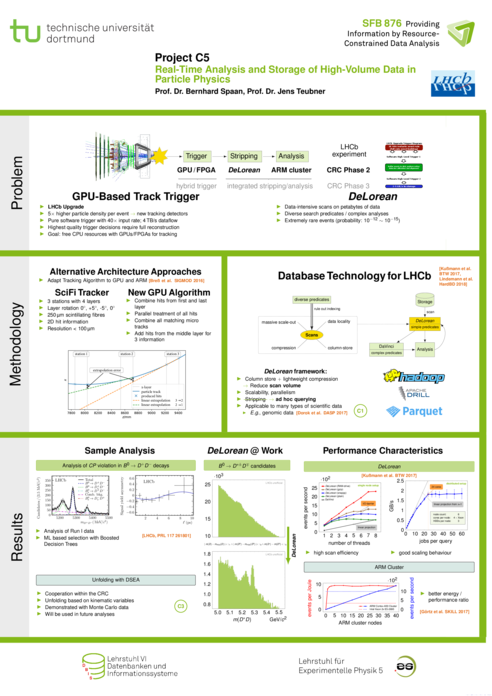 We proposed, e.g., new GPU-based algorithms; a novel filter mechanism (named DeLorean); and parallelisation mechanisms for LHCb analyses (including a tailor-made low-power hardware platform). 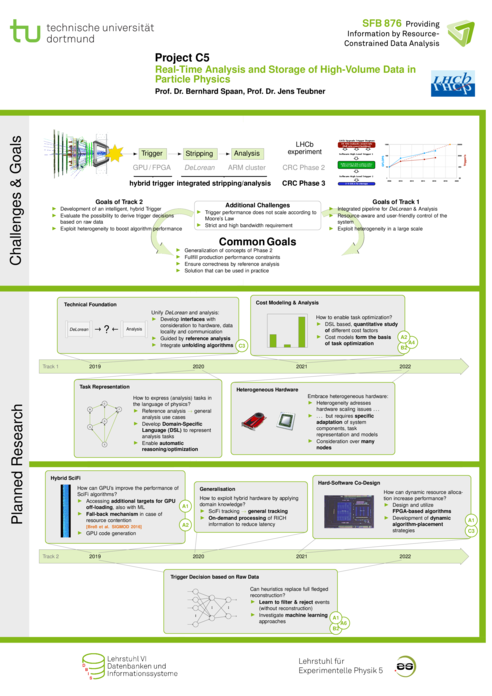 Our umbrella goal for phase 3 is to connect those solutions towards a new design for the overall processing pipeline at LHCb. To this end, we want to, e.g., integrate our parallel data selection engine DeLorean with a Map-Reduce-based analysis framework and extend both parts by GPU acceleration. Lindemann/2018a Lindemann, Thomas. Efficient Track Reconstruction on Modern Hardware. No. 1, DBIS Group, Chair 6, Department of Computer Science, 2018. Lindemann/etal/2018a Thomas Lindemann and Jonas Kauke and Jens Teubner. Efficient Stream Processing of Scientific Data. In Proc. of the Joint HardBD & Active '18 Workshop, Paris, France, 2018. Aaij/etal/2016k Aaij, R., ..., Schellenberg, M. et al.. Search for the $C\!P$-violating strong decays $\eta \to \pi^+\pi^-$ and $\eta^\prime(958) \to \pi^+\pi^-$. In Phys. Lett., Vol. B764, pages 233-240, 2017. Aaij/etal/2016n Aaij, R.,..., Schellenberg, M. et al.. Observation of $J/\psi\phi$ structures consistent with exotic states from amplitude analysis of $B^+\to J/\psi \phi K^+$ decays. In Phys. Rev. Lett., Vol. 118, No. 2, pages 022003, 2017. Aaij/etal/2016o Aaij, R.,..., Schellenberg, M. et al.. Amplitude analysis of $B^+\to J/\psi \phi K^+$ decays. In Phys. Rev., Vol. D95, No. 1, pages 012002, 2017. Aaij/etal/2016r Aaij, R.,..., Schellenberg, M. et al.. First experimental study of photon polarization in radiative $B^0_s$ decays. In Phys. Rev. Lett., Vol. 118, No. 2, pages 021801, 2017. Aaij/etal/2016t Aaij, R.,..., Schellenberg, M. et al.. Observation of $B^+\rightarrow J/\psi 3\pi^+ 2\pi^-$ and $B^+\rightarrow \psi(2S) \pi^+\pi^+\pi^-$ decays. In Eur. Phys. J., Vol. C77, No. 2, pages 72, 2017. Aaij/etal/2016u Aaij, R.,..., Schellenberg, M. et al.. Observation of the decay $B^0_s \to \phi\pi^+\pi^-$ and evidence for $B^0 \to \phi\pi^+\pi^-$. In Phys. Rev., Vol. D95, No. 1, pages 012006, 2017. Aaij/etal/2016v LHCb Collaboration and Aaij, R. and Eitschberger, U. and Schellenberg, M. and Spaan, B. and et al.. New algorithms for identifying the flavour of $\mathrm B ^0$ mesons using pions and protons. In European Physical Journal C, Vol. C77, No. 4, pages 238, 2017. Aaij/etal/2016w Aaij, R.,..., Schellenberg, M. et al.. Observation of the annihilation decay mode $B^0\to K^+K^-$. In Phys. Rev. Lett., Vol. 118, No. 8, pages 081801, 2017. Aaij/etal/2016x Aaij, R.,..., Schellenberg, M. et al.. Search for decays of neutral beauty mesons into four muons. In JHEP, Vol. 03, pages 001, 2017. Aaij/etal/2016y Aaij, R.,..., Schellenberg, M. et al.. Measurement of the $b$-quark production cross-section in 7 and 13 TeV $pp$ collisions. In Phys. Rev. Lett., Vol. 118, No. 5, pages 052002, 2017. Aaij/etal/2016z Aaij, R.,..., Schellenberg, M. et al.. Observation of the suppressed decay $\Lambda^0_b\rightarrow p\pi^-\mu^+\mu^-$. In JHEP, Vol. 04, pages 029, 2017. Aaij/etal/2017a LHCb Collaboration and Aaij, R. and Schellenberg, M. and Spaan, B. and Stevens, H. and et al.. Measurement of $CP$ violation in $B^0\rightarrow J/\psi K^0_ \mathrmS $ and $B^0\rightarrow\psi(2S) K^0_\mathrmS$ decays. In Journal of High Energy Physics, Vol. 11, pages 170, 2017. Dorok/etal/2017a Sebastian Dorok and Sebastian Breß and Jens Teubner and Horstfried Läpple and Gunter Saake and Volker Markl. Efficient Storage and Analysis of Genome Data in Databases. In Datenbanksysteme für Business, Technologie und Web (BTW), pages 423--442, 2017. Dorok/etal/2017b Sebastian Dorok and Sebastian Breß and Jens Teubner and Horstfried Läpple and Gunter Saake and Volker Markl. Efficiently Storing and Analyzing Genome Data in Database Systems. In Datenbank-Spektrum, 2017. Goertz/etal/2017a Görtz, Michael Dominik and Kühn, Roland and Zietek, Oliver and Bernhard, Roman and Bulinski, Michael and Duman, Dennis and Freisen, Benedikt and Jentsch, Uwe and Klöppner, Tobias and Popovic, Dragana and Xu, Lili. Energy Efficiency of a Low Power Hardware Cluster for High Performance Computing. In Eibl, Maximilian and Gaedke, Martin (editors), INFORMATIK 2017, pages 2537-2548, Gesellschaft für Informatik, Bonn, 2017. Kussmann/etal/2017a Kussmann, Michael and Berens, Maximilian and Eitschberger, Ulrich and Kilic, Ayse and Lindemann, Thomas and Meier, Frank and Niet, Ramon and Schellenberg, Margarete and Stevens, Holger and Wishahi, Julian and Spaan, Bernhard and Teubner, Jens. DeLorean: A Storage Layer to Analyze Physical Data at Scale. In B. Mitschang et al. (Hrsg.) (editors), Datenbanksysteme für Business, Technologie und Web (BTW 2017), Vol. P-265, pages 413-422, GI, 2017. Aaij/etal/2016a Aaij, R., ..., Schellenberg, M. et al.. First study of the CP -violating phase and decay-width difference in $B_B^0\to \psi(2S)\phi$ decays. In Phys. Lett., Vol. B762, pages 253-262, 2016. Aaij/etal/2016b Aaij, R., ..., Schellenberg, M. et al.. Measurement of forward $W\to e\nu$ production in $pp$ collisions at $ \sqrts=8\,$ TeV. In JHEP, Vol. 10, pages 030, 2016. Aaij/etal/2016d Aaij, R., ..., Schellenberg, M. et al.. Search for structure in the $B_s^0\pi^\pm$ invariant mass spectrum. In Phys. Rev. Lett., Vol. 117, No. 15, pages 152003, 2016. Aaij/etal/2016e Aaij, R., ..., Schellenberg, M. et al.. Measurement of the ratio of branching fractions $ \mathcalB (B_c^+ \to J/\psi K^+)/\mathcalB(B_c^+ \to J/\psi\pi^+)$. In JHEP, Vol. 09, pages 153, 2016. Aaij/etal/2016g Aaij, R., ..., Schellenberg, M. et al.. Measurement of the $B_s^0 \rightarrow J/\psi \eta$ lifetime. In Phys. Lett., Vol. B762, pages 484-492, 2016. Aaij/etal/2016h Aaij, R., ..., Schellenberg, M. et al.. Study of $B_c^+$ decays to the $K^+K^-\pi^+$ final state and evidence for the decay $B_c^+\to\chi_c0\pi^+$. In Phys. Rev., Vol. D94, No. 9, pages 091102, 2016. Aaij/etal/2016j Aaij, R., ..., Schellenberg, M. et al.. Amplitude analysis of $B^- \to D^+ \pi^- \pi^-$ decays. In Phys. Rev., Vol. D94, No. 7, pages 072001, 2016. Aaij/etal/2016l Aaij, R., ..., Schellenberg, M. et al.. Measurement of the CKM angle $\gamma$ from a combination of LHCb results. In JHEP, Vol. 12, pages 087, 2016. Aaij/etal/2016m Aaij, R.,..., Schellenberg, M. et al.. Measurements of the S-wave fraction in $B^0\rightarrow K^+\pi^-\mu^+\mu^-$ decays and the $B^0\rightarrow K^\ast(892)^0\mu^+\mu^-$ differential branching fraction. In JHEP, Vol. 11, pages 047, 2016. Aaij/etal/2016p Aaij, R.,..., Schellenberg, M. et al.. Measurement of the forward Z boson production cross-section in pp collisions at $\sqrts = 13$ TeV. In JHEP, Vol. 09, pages 136, 2016. Aaij/etal/2016q LHCb Collaboration and Aaij, R. and Meier, F. and Schellenberg, M. and Spaan, B. and et al.. Measurement of $CP$ violation in $B^0 \to D^+ D^-$ decays. In Physical Review Letters, Vol. 117, No. 26, pages 261801, 2016. Aaij/etal/2016s Aaij, R.,..., Schellenberg, M. et al.. Differential branching fraction and angular moments analysis of the decay $B^0 \to K^+ \pi^- \mu^+ \mu^-$ in the $K^*_0,2(1430)^0$ region. In JHEP, Vol. 12, pages 065, 2016. Bress/etal/2016a Sebastian Breß and Henning Funke and Jens Teubner. Robust Query Processing in Co-Processor-Accelerated Databases. In Proceedings of the 2016 ACM SIGMOD Conference on Management of Data, San Francisco, CA, USA, ACM, 2016. Aaij/etal/2015a LHCb Collaboration and Aaij, R. and Adeva, B. and Adinolfi, M. and Affolder, A. and Spaan, B. and et al.. Measurement of C P Violation in $B^0 \to J /\psi K_S^0$ Decays. In Physical Review Letters, Vol. 115, No. 3, pages 031601, 2015. Eitschberger/2018a Eitschberger, Ulrich Paul. Flavour-tagged Measurement of CP Observables in $B_s^0 \rightarrow D_s^\mp K^\pm$ Decays with the LHCb Experiment. TU Dortmund, 2018. Meier/2016a Frank Meier. Measurement of $\sin2 \beta$ using charmonium and open charm decays at LHCb. TU Dortmund University, 2016. Swientek/2015a Swientek, Stefan. A data processing firmware for an upgrade of the Outer Tracker detector at the LHCb experiment. TU Dortmund, 2015. Schleich/2011a Schleich, Sebastian. First measurement of the inclusive $\phi$ meson production cross section in pp collisions at $\sqrt s = 7$ TeV and search for CP-violation in the $B_s\rightarrow\phi\phi$ decay at LHCb. TU Dortmund, 2011. Balkesen/Teubner/2014a Cagri Balkesen and Jens Teubner and Gustavo Alonso and M. Tamer Öszu. Main-Memory Hash Joins on Modern Processor Architectures. In IEEE Transactions on Knowledge and Data Engineering, 2014. Aaij/B/2013a Aaij, R and andere (inkl. Spaan, B. (LHCb Collaboration)). Measurement of the time-dependent $CP$ asymmetry in $B^0 \to J/\psi K^0_\rm S$ decays. In Phys.Lett., Vol. B721, pages 24-31, 2013. Aaij/B/2013b Aaij, R and andere (inkl. Spaan, B. (LHCb Collaboration)). Measurement of the $B^0$--$\bar B^0$ oscillation frequency $\Delta m_d$ with the decays $B^0 \to D^- \pi^+$ and $B^0 \to J\ \psi K^*0$. In Phys.Lett., Vol. B719, pages 318-325, 2013. Balkesen/etal/2013c Cagri Balkesen and Jens Teubner and Gustavo Alonso and M. Tamer Özsu. Main-Memory Hash Joins on Multi-Core CPUs: Tuning to the Underlying Hardware. In Proc.\ of the 29th IEEE Int'l Conference on Data Engineering (ICDE), pages 362--373, Brisbane, Australia, 2013. Teubner/etal/2013a Jens Teubner and Louis Woods and Chongling Nie. XLynx---An FPGA-Based XML Filter for Hybrid XQuery Processing. In ACM Transactions on Database Systems (TODS), Vol. 38, No. 4, pages 23, 2013. Woods/etal/2013a Louis Woods and Gustavo Alonso and Jens Teubner. Parallel Computation of Skyline Queries. In 21st IEEE Annual Int'l Symposium on Field-Programmable Custom Computing Machines (FCCM), pages 1-8, Seattle, WA, USA, 2013. Roy/etal/2012a Pratanu Roy and Jens Teubner and Gustavo Alonso. Efficient Frequent Item Counting in Multi-Core Hardware. In Proc. of the 18th ACM SIGKDD Int'l Conference on Knowledge Discovery and Data Mining (KDD), pages 1451--1459, Beijing, China, 2012. Woods/etal/2010a Louis Woods and Jens Teubner and Gustavo Alonso. Complex Event Detection at Wire Speed with FPGAs. In Proc.\ of the VLDB Endowment (PVLDB), Vol. 3, No. 1, Singapore, 2010. Mueller/etal/2009b René Müller and Jens Teubner and Gustavo Alonso. Streams on Wires---A Query Compiler for FPGAs. In Proceedings of the VLDB Endowment, Vol. 2, No. 1, pages 229--240, Lyon, France, 2009. Nedos/2008a Nedos, Mirco. Entwicklung, Implementierung and Test eines FPGA-Designs f\FCr die Level-1-Frontend-Elektronik des \C4usseren Spurkammersystems im LHCb-Detektor. TU Dortmund, 2008.